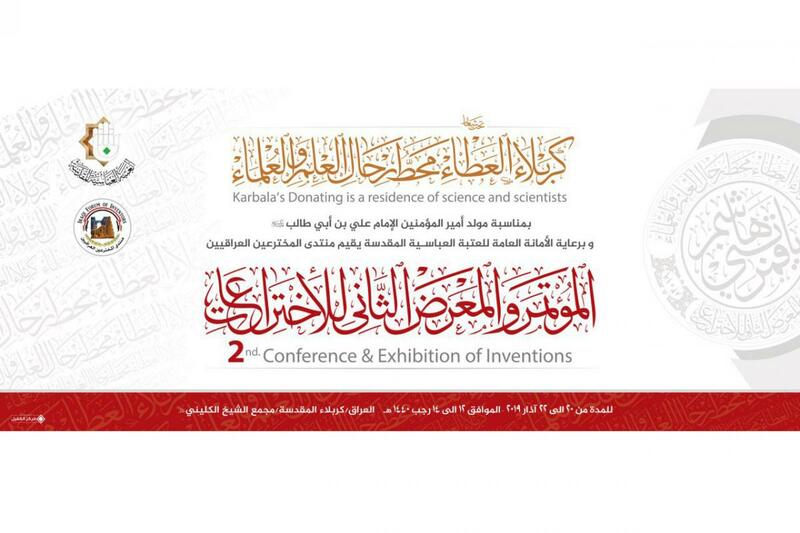 The al-Abbas's (p) Holy Shrine announces embracing the Second Conference and Exhibition of Inventions. After the success of the first edition of the conference and exhibition of inventions, the al-Abbas's (p) Holy Shrine announced its intention to launch its second edition under the slogan "Karbala of generosity; the terminal of Science and Scientists" from 20 to 22nd March 2019, corresponding to 12 to 14th Rajab 1440 AH to coincide with the birth anniversary of the Commander of the Faithful; Imam Ali (peace be upon him) in cooperation with the forum of Iraqi inventors. On this occasion, Mr. Jawad al-Hasnawi, member of the board of directors of the al-Abbas's (p) holy shrine and a member of the Supreme Committee overseeing the conference and exhibition, said: "In continuation of the first conference and exhibition, the General Secretariat of the al-Abbas's (p) Holy Shrine will hold the second conference and exhibition of inventions in cooperation with the Iraqi Inventors Forum. This conference is one of the many activities sponsored by the al-Abbas's (p) holy shrine in order to embrace and develop the Iraqi energies represented by inventors and researchers, especially that Iraq has such energies that need attention and care so they do not flee our country to another country." Engineer Jafar Saeed Al Khayat, member of the Supreme Committee overseeing the conference and exhibition, said: "The conference is one of the important conferences that the al-Abbas's (p) holy shrine has continued to support. The necessary preparations were made before the convening of the meeting. The al-Abbas's (p) holy shrine was also keen to care for the new inventions' patents that resulted from this conference, which are expected to contribute to the support and development of the national product, focusing on engineering, agricultural, industrial, environmental, and medical specialties." First: to support and encourage Iraqi minds, to discover and develop inventions. Second: To contribute to the crystallization of the research and inventions and translate them on the ground and turn them into a tangible scientific achievement that contributes to achieving the objectives envisaged by it in both short and long term. Third: Investment of inventions' patents and industrial models to promote the economic reality of the country. Fourth: To contribute to improving the Iraqi economy by embracing the owners of inventions' patents and projects. Fifth: To contribute to making the achievements of inventors and researchers enter the phase of experimentation and field application. Sixth: Investment of patents and industrial models, and transfer them to technology and applied products. Seventh: To educate everyone about the importance of invention, making the Iraqi society understand the extent of the need for inventors and inventions.